Elephant head rock is the best and most exciting dive of the nine Similan islands. A massive collection of granite boulders create huge swim throughs, caverns and channels. There can be strong currents but this only helps the dive site feel more alive. Dive deeper to look for a variety of sharks and rays. You might need a bit of imagination to see the Elephant’s head though. Sitting in the open ocean, 1km South West of Similan island eight, Elephant head rock is quite exposed. Waves and strong currents can make it difficult. However, fascinating and unique contours make it an unmissable dive. Home to sharks, rays, giant trevally, tuna and more. It may not quite reach the epic scale of Koh Tachai Pinnacle, but a maze of swimthroughs more than makes up for it. Weave your way through various caverns and openings and you can always find something new. Elephant head rock’s unique layout makes it extremely memorable and it is many diver’s favourite dive on a Similan liveaboard. The granite boulders are some of the most impressively sized in the Andaman sea and they form a maze of swim throughs and caverns. Strong currents bring lots of life. You can see large trevally and tuna much more regularly than at other Similan dive sites. In February and March the strong currents can also attract Manta Rays and Whale Sharks. This is one of the more advanced dive sites so is not recommended for complete beginners. Open Water divers are able to dive here but will be restricted from entering the deeper swim throughs. The dive is better suited to Advanced Open Water divers. Experience diving in current would also be a positive. If you have never dived in current before it would be recommended to try a drift dive first. You can read our guide for diving in current here. For the best chance of encountering sharks, stay on the North side of the dive site. White tip reef sharks and shovel nose rays appear to enjoy peace and quiet. They usually lay down undisturbed on the sea bed, so if you find a shark, please do your best to leave it in peace. The Northern section of the site extends out unexpectedly far and drops to 40m and deeper. If you have completed the deep specialty course, dive on 28% nitrox and spend more time swimming at around 35m. The L-shaped swim through right at the heart of the dive site is a must. Even though it is wide enough to fit a few divers, it is best experienced by diving in single file. 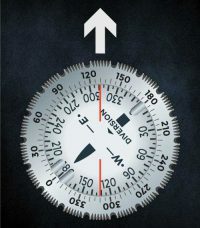 Allow the dive leader to enter first and then follow one by one. If you have a torch then use it. Try to maintain neutral buoyancy and swim slowly to enjoy the experience even more. Read the dive briefing below if you would like to know how and where to find it. Boulders, on top of boulders, surrounded by boulders. If you hadn’t already guessed, there are a lot of granite boulders. Steep drop offs go from the surface all the way down to 50m in a relatively short distance. If wind and waves are too strong then it is not always possible to dive here. The drop offs and pick ups can be unsafe. Underwater, the dive site is more prone to stronger currents and also sometimes heavy surge. There are obviously countless opportunities for wide angle photography on such an impressively large dive site. However, ribbon eels, ghost pipefish, sea moths, nudibranchs and more are all good for macro photography. Stay to the South West of the dive site for the entire dive. The North East is just one big rock face that drops to 50m with very little on it. The South West side is a much more complex structure with many more interesting features. Elephant Head Pinnacle lies much deeper to the South of the Main dive site. As it is so deep and there is no buoy line, Elephant head pinnacle is very rarely dived. However, it is a fantastic dive with pristine corals. Experienced divers that want to dive Elephant head pinnacle can contact us for more advice. Elephant head rock may well be your best dive in the Similan Islands, but may also be the most difficult. The dive site is much more prone to stronger currents because it is an exposed pinnacle away from the islands. A successful and fun dive at Elephant Head Rock will always require a good dive plan. The entry is often the most important part of the dive at any dive site in the Similans. Here is no exception. There are several boulders visible from the surface. The largest one is to the North West. This is the one that also provides the most protection. On the South side of this large rock is an indentation that (almost) forms a small bay. This is often the perfect place to jump. After you enter the water, quickly group up with your buddy and the rest of your dive team and start to descend. If you jumped near this small ‘bay’ then you will hopefully have a nice and easy descent next to this large rock. If you start to drift away from the rock then remember to swim back towards it as you are descending. Once you get down to around 10m-15m, keep closely hugging the rocks and start swimming South East. The first interesting structure you will reach is a large channel with a depth of around 18m. This is particularly fun when the current is behind you and pushes you all the way through. At the end of the channel on the right hand side is a hole in the rock about the size and shape of a watermelon. This makes for a fun photo opportunity. It is the perfect size to act as a frame for your face. If your buddy stays inside the channel with a camera and you swim around the outside you can get your new Similan islands Facebook profile photo. Stay to the left hand side as you exit the channel. Follow the rocks around the corner. Just outside the channel is a good place to look for ribbon eels. Keep heading South East and you will reach the best part of the dive site. Drop down to about 22m. Elephant head rocks biggest and best swim throughs are no more than 40m past the exit of the channel. This L-shaped swim through is a good 50m long, but there is plenty of light and always a clear exit to the surface. This swim through takes you right into the middle of Elephant head rock. Turn to the right and you will be lead back out into the open water. Depending on your decompression time and air consumption, you can either start to shallow up or head out deeper to the North. Out Deep is where you can look for sharks and rays. Kuhl’s stingrays, Jenkins rays, White tip reef sharks and even shovel nose rays live around these rocks, but you will need to go quite deep. At 30m you will have quite a good chance, but this is a good dive site for a deep specialty diver. If you go to the far North side and drop to 40m then sharks and rays are all but guaranteed. There are dozens of caverns and swim throughs to be discovered as you shallow up. There are far too many to mention here so if you cover the main areas mentioned above then you can enjoy freedom on the rest of the dive. Take your time exploring the best dive site in the Similan islands. Use this route at slack tide or when the current is moving roughly West to East. Jump in to the South of the largest boulder visible from the surface. Stay near the rocks as you descend to get protection from the current. After descending to around 15m, head South East towards the biggest channel. Swim through the channel, passing the hole in the rock, and then drop deeper to find the large swim through. Spend the rest of the dive weaving in and out of the boulder formations on the South East of the Dive site. There are many caverns and routes to explore. Head out to your deepest point to look for Sharks and Rays. If you ever used to stare at the clouds as a child then you will understand where the name Elephant Head Rock came from. Remeber the changing shapes of clouds turning into different animals and objects. What you saw was only restricted by your imagination. It seems the naming of many Similan island dive sites was done using the same approach. The Similan islands are prehistoric. They are believed to have originated some time in the early mesozoic era meaning they predate most of the dinosaurs. Subduction of tectonic plates to the West resulted in eruptions of molten magma that burst through the ocean floor and rose to the surface. Giant granite boulders formed the foundations of the Similan islands. Years of erosion and weathering have molded them into strange and interesting shapes. This geology is the basis of all the famous sites we see today. The most famous rock of all is the majestic ‘Sail Rock’; a huge monolith positioned in a picture perfect location on top of Donald duck bay. What can you see in the shapes of the Similan Islands? Sail Rock sits precariously on top of Donald duck bay at the north of Similan island eight. However, the rock facies create magnificent and interesting shapes all around the nine islands. Many are overlooked but equally impressive. Elephant head rock is by far the most fascinating boulder dive site in the area. Fish stay near the protection of the rocks including the beautifully colourful Boxfish (pictured). But even without the plethora of marine life, the epic scale of this dive site is enough to impress the most seasoned of divers. To understand where the name comes from, you will need to think back to your imaginative childhood days and remember the shapes you saw in the clouds. It is not clear who coined the name Elephant Head Rock. The most popular Thai name translates as the more ominous ‘Skull rock’ (or technically more accurate; ‘Cranium Rock’). Revive your childhood imagination and you may see an Elephant’s head, a skull or maybe something entirely different. As you approach the dive site you can see a few big boulders protruding from the surface. If you approach from the south, the largest rock on the West side supposedly looks like the crown of an Elephant’s head. The smaller boulder to the east appears to be the tip of its trunk protruding out from the water. If you use (a lot of) your imagination, then you should be able to see it. Coincidentally, an aerial shot of the largest rock on the North side looks much more like the profile of an Elephant’s head. You can see this from Google Earth satellite photos. 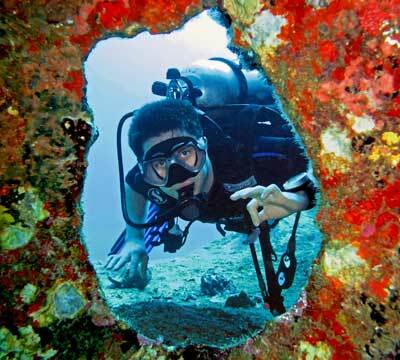 Other less famous dive sites in the Similans are named with equal amounts of imagination. Visit shark fin reef, turtle rock, eagle rock, whale back rock, old man rock and countless more. There are animals, objects and people hidden in the unique formations of ancient boulders. If it has been an age since you had time to stare at the clouds, then come and take a look at the prehistoric shapes that form the Similan islands.